Constance D. Casserly has over 30 years of experience as an English Language Arts teacher in Middle Schools and High Schools. She has taught English 7-12, Journalism, and Creative Writing. For thirteen years, she sponsored the high school's award-winning literary and art magazine as well as the monthly high school newspaper. 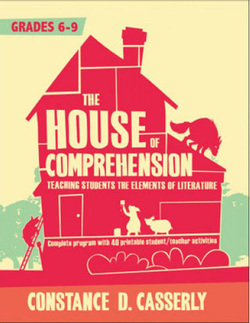 Casserly's book, "The House of Comprehension" is a complete guide for English Language Arts teachers to help teach students how to understand structure in litera­ture. The elements of literature character, plot/conflict, setting, theme, symbols, point of view, and tone are the building blocks of the house of comprehension. Each element contributes to the entire piece of literature, and students must learn what they all mean in order to fully comprehend the literature. Just like the Three Little Pigs, students need to know how to build strong "houses of comprehension" that expand their knowledge, enhance their perception of the structure of texts, and develop strong reading skills that will last a lifetime. No Big Bad Wolf can blow down a student's house of comprehension once a teacher uses the ideas laid out in this book!